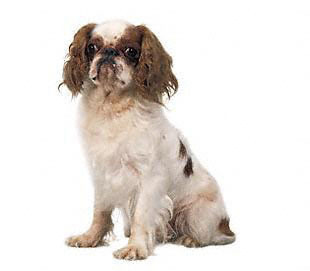 Named after King Charles II, the English Toy Spaniel, began only as a small sporting spaniel, till earning the favor of the king and English royalty.It is a breed of dogs that is considered to be sociable, undemanding and well liked. They are sturdy and squarely built, with a short nose and domed head, at a glance and yet they exude a regal and dignified demeanor when looked upon.They are also the smallest amongst all the other spaniels.The breed of today that we see, was cross-bred with the Oriental short-nosed dog, during the 18th century. They are charming, gentle and loving by nature, thus making good companions for children and other pets. Furthermore, the English Toy Spaniels are known to be happiest, when in the company of their families, they are committed to their homes and remain contented within they homely environment. It is noteworthy to know that this English Toy Spaniel breed is otherwise referred to as King Charles Spaniel, other than in North America. This breed tends to suffer in hot and humid climate. Health disorders include: eye conditions, slipped stifle, ear infections, heart problems and respiratory conditions and so should not be overly exerted. Being a short-nosed breed they tend to wheeze and snore. It is vital to clean their ears and eyes daily and their coat should be brushed daily to keep shedding to a minimum and shampoo only when needed. They should be kept away from extreme cold and heat.